Initial reports on the working conditions at Chinese manufacturing plants that produce Apple iPads and iPhones suggest they are much better than those at other facilities across the country. 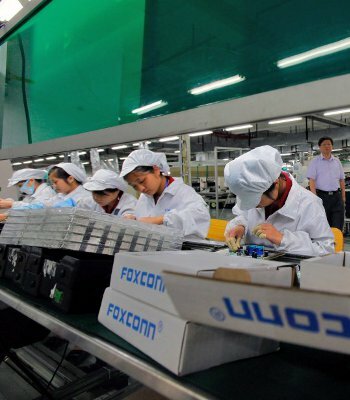 Auret van Heerden, president of the Fair Labor Association, noted that Foxconn facilities were first-class with physical conditions way above average, according to a new report from Reuters. During recent trips to Foxconn plants over the past several days, van Heerden said that based on how tranquil the facilities are, boredom and alienation are perhaps a bigger problem than intensity and burnout from a pressure-cooker environment like those typically found in garment factories. On the topic of suicides in Chinese factories since the 1990s, he pointed to the fact that many of the young factory workers come from rural areas and are away from their families for the first time. It can be difficult for a young person to assimilate to an industrial lifestyle so quickly without any emotional support. An interim report from the FLA is due in early March with feedback from roughly 35,000 factory workers spread across two Foxconn factories. The respondents will answer multiple questions anonymously and the data will be uploaded and consolidated into the initial report. A full report will highlight areas that need improvement and offer suggestions, says van Heerden. The FLA was created by President Bill Clinton in 1999 to put an end to child labor and other sweatshop practices around the globe. Companies that voluntarily join the FLA are subject to independent and unannounced audits of factories to verify compliance of standards. Van Heerden noted that his organization wouldn’t falsely paint a positive picture for Apple suppliers, as some might suggest, and that Apple voluntarily joined the FLA.
"Apple didn't need to join the FLA. The FLA system is very tough. It involves unannounced visits, complete access, public reporting. If Apple wanted to take the easy way out there were a whole host of options available to them," he said. "The fact that they joined the FLA shows they were really serious about raising their game."